CUSTOM DESIGNER INTERIORS MADE FOR YOU AND DELIVERED TO YOUR STATE. ISPS Innovations cover a broad range of custom DIY interior products nationally delivered all over Australia. Bonethane Premium Splashbacks in any colour! 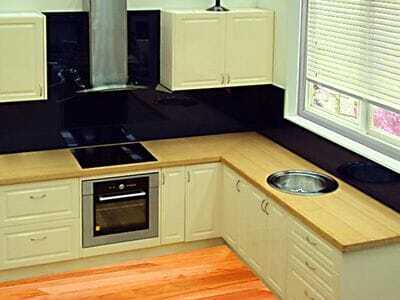 2440 x 1220 x 5mm Bonethane Premium Splashbacks Sheets in any solid colour $519 delivered to metro areas nationally. Additonal charge outside metro zoned areas. Bonethane Premium Splashback Packs available, includes BP sheet, solid colour match, glass insert for cook top in silver, 3 straight cuts, trim, filler or customise to suit your application. NOTE: custom glass or colour toning glass to blend with Bonethane is an addtional charge. Bonethane Premium does not split or crack when cutting with standard fabricating equiptment. With our offers above we include a practice piece, for your peace of mind. Another first by ISPS Innovations. ISPS offer a cutting service. 1 Straight cut $45.00, 4 to 6 straight cuts $139.00, 10 to 12 straight cuts $172. You will need to provide a signed or confirmed cutting list prior to cutting.